Isola™ Filtered Chemical Workstations are the next advanced solution in ductless technology. 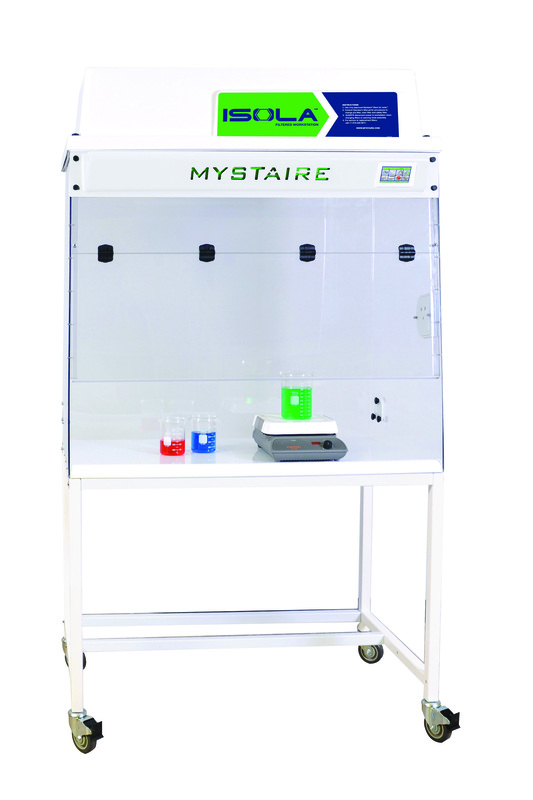 For over 50 years Mystaire® safety products have provided laboratory personnel with market leading safety features and reliable service. Isola™ filtered chemical workstations are a series of high efficiency products that provide protection to the end user and environment from hazardous chemical fumes and vapors. The key feature to Isola™ workstations superior safety is the filtration matrix. The Isola™ filtration matrix is configured of three stages of filtration media that effectively adsorb and capture a wide range of contaminates. The Isola™ Filtered Chemical Workstation Series consists of three models, providing customers with a variety of options without compromising safety. The Isola™ VUE features a 360° clear viewing area which makes it ideal for demonstration experiments. The Isola™ PRO is a polypropylene filtered chemical workstation offering excellent chemical resistance for corrosive applications. The Isola™ EDGE offers a dual wall thermally-fused solid polypropylene main chamber allowing the installation of common laboratory fixtures and electrical outlets if needed. Each Isola™ features the EverSafe™ III Touch Screen controller, which puts control of the workstation at the end-users fingertips.